Theophilus London has finally detailed his long-awaited collaboration with Tame Impala’s Kevin Parker, a super-duo now officially known as Theo Impala. The pair were first spotted together in 2016, collaborating on a track (“Whiplash”) that premiered on Virgil Abloh’s Beats 1 show, but was otherwise unreleased. Then, back in October, London shared a few cryptic social media posts hinting at further collaboration. Not long after, the pair performed a live show in West Hollywood, debuting two tracks via grainy, fan-captured video. The first of the two tracks, “Only You,” a cover of Steve Monite’s ‘80s gem, was released later in October with an accompanying music video. Now, London has not only officially detailed the duo’s collaboration, but in doing so has also announced the official release date of his forthcoming album—the album on which Theo Impala will appear, both through “Only You” and “Whiplash”—due out on Feb. 22, 2019. 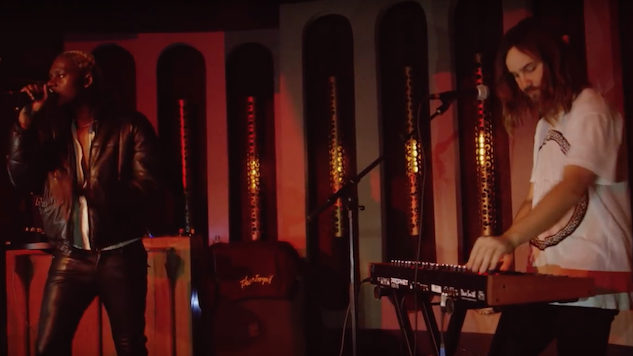 With the announcement came two live videos from the duo’s West Hollywood debut. Check those out below and find the “Only You” music video beneath that. For more Theophilus London and Tame Impala content, find performances from both from the Paste archives further down.